My Raspberry Pi media player suite has reached a generally usable level. At the bottom of the stack there is omxplayer, then the omxd playlist daemon, the rpi.fm command-line internet radio player and, finally, RemotePi the remote control web-app, optimized for smart-phone screens. Check out its home page. I admit I suffer from severe NIH (Not Invented Here) symptoms. But this time, I actually tried to install XBMC from Michael Gorven’s Debian package. But what do I see? I need to get 44 MB of archives. 120 MB additional disk space will be used. RemotePi, rpi.fm and omxd are 3 MB including all sources, all binaries and all git repositories. And lo and behold, who are among the dependencies? Come on! I never use my Raspberry’s GUI. All the GUI RemotePi has is a web-app. MySQL? Probably a sign of a nice tag-based media library which, in real life, is an absolute pain in the neck to use. 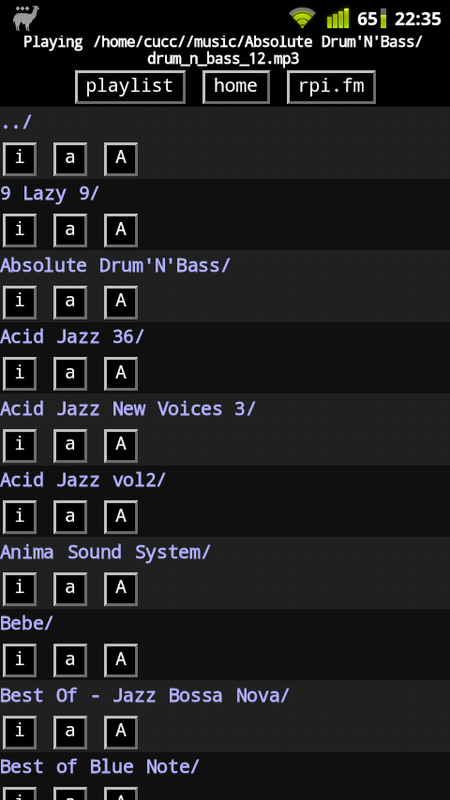 You have a DJ-set album, from all sorts of different artists, and a tag-based player just refuses to play it in the order intended by the DJ. I’ll stick to my files and directories, thank you very much. Samba? I’m one of those smug Penguinistas whose home is Windows-free. So no thanks.